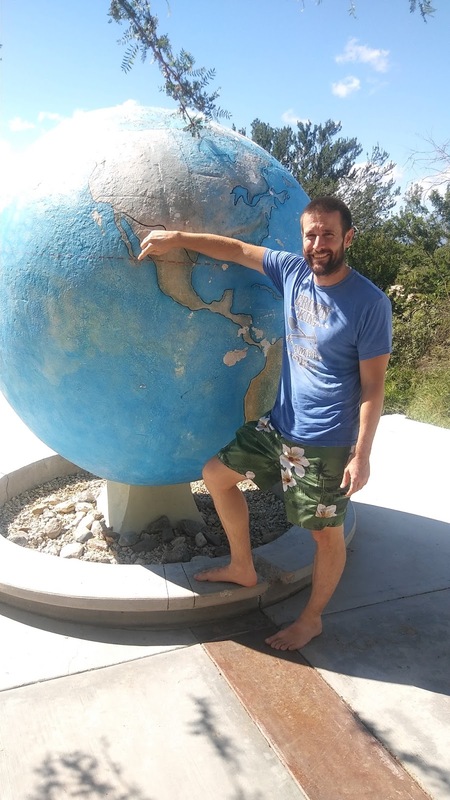 Every couple of years, when our youngest is weaned and old enough to be left home, my husband and I enjoy taking a trip without any of the kids. 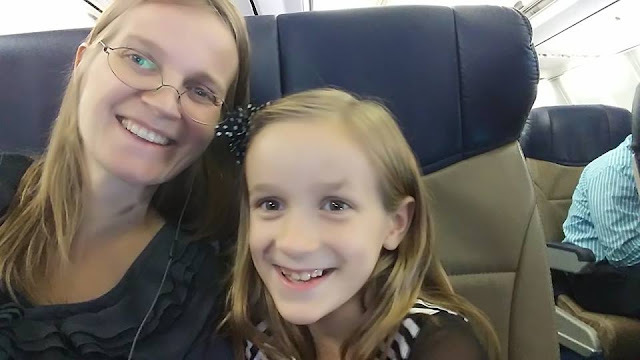 Two years ago, we went on a wonderful vacation to Maui, as well as a family trip to a cabin in the mountains, both of which were gifts from our church members and online listeners to celebrate our church's 10-year anniversary. Our normal budget does not have room for such extravagant trips. In fact, it was not in our budget to go anywhere at all at this time. However, I still wanted to surprise my husband with a trip for his birthday in July, as well as our 17-year wedding anniversary in August. The profits from my online business are mine to spend as I see fit. 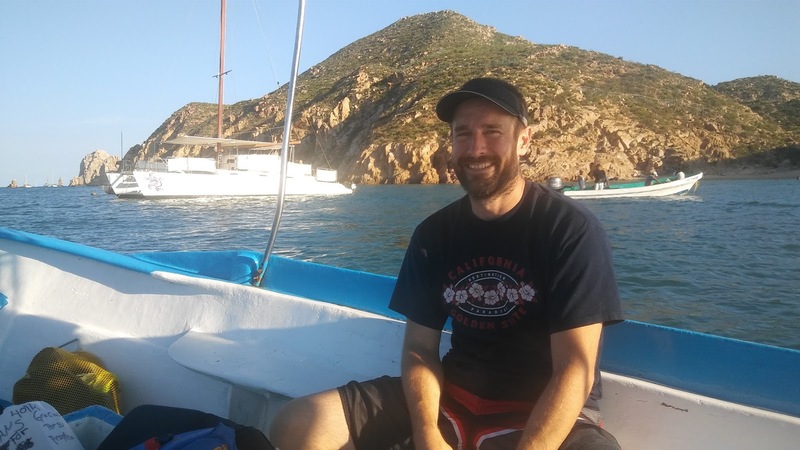 I not only finally got into the black this summer, but had made enough to buy two highly discounted flight tickets to San Jose del Cabo at the tip of the Baja, California peninsula. 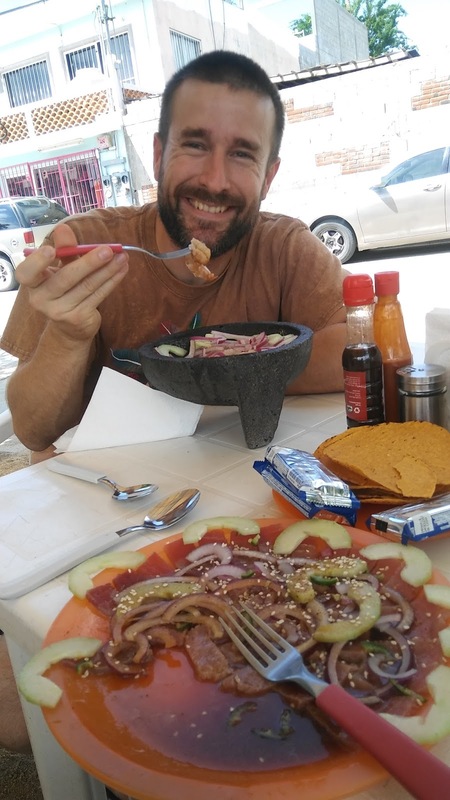 My husband had been wanting to go to Baja since before we even met, and had mentioned wanting to go there someday many times. 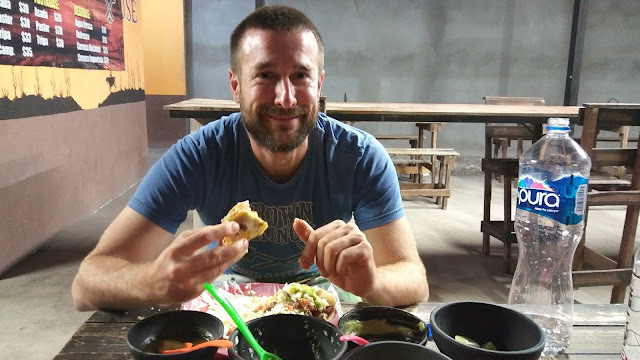 While I had no money left to spend on lodging and meals, I knew both would be cheap in Mexico, and something we could eek out of the budget if the flights were covered. As it turned out, the ladies in our church surprised me with a gift basket back in August, which among many lovely gifts contained a lot of gift cards like Visa, Whole Foods, Amazon, etc. I spent these on necessities we were going to buy anyway, like diapers and gas, but kept track of it all, thus turning my gifts into a fund to be used to cover the remaining expenses of our Baja vacation. My wonderful mother-in-law readily agreed to watch the monkeys for us while we were gone for six days. As always, she did a fantastic job with them, and I didn't worry about the kids once while we were gone, knowing they were in capable hands. We flew out Monday morning of last week. 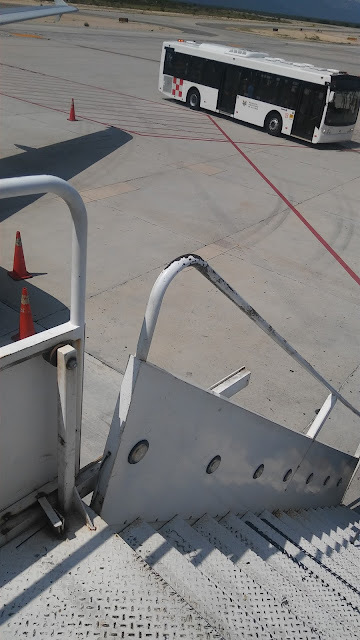 The flight was direct and only took 2 hours. Due to the time difference, we arrived in the early afternoon. 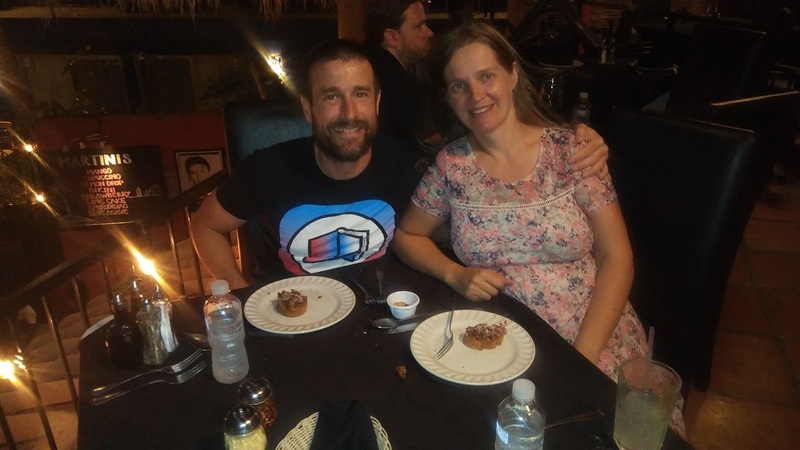 By the time we got our bags and rental car, we were both famished, and desperate to find food. 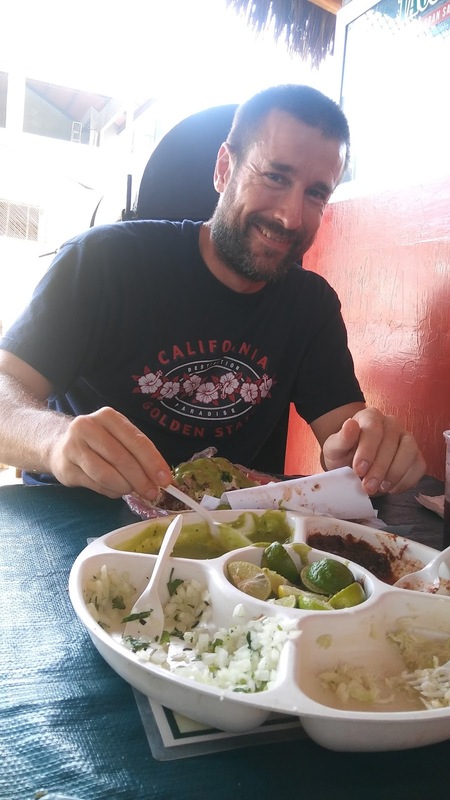 Turns out, finding Mexican food in Mexico is not as easy as it might seem! We quickly learned why our flight tickets had been so cheap: we were traveling during the off season, which is the off season because it's a) hot, and b) hurricane season. There had been two hurricanes in the area in the two weeks before our visit! Anyway, tons of food places were closed for the summer. 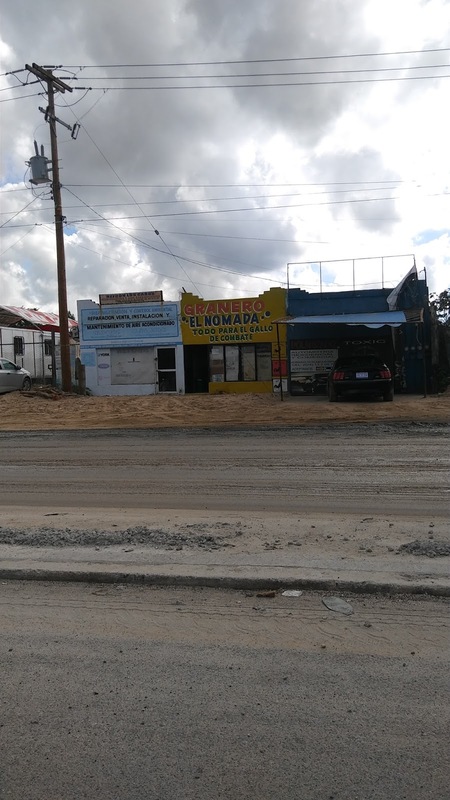 Parking was a challenge because the entire town of San Jose is being torn apart and rebuilt to prepare for more tourism. We finally stumbled across a little outdoor food place, and decided to get food there. The 'menu' consisted of two photographs mounted on the wall. They only had two options - shrimp or tuna - so my husband chose shrimp and I went with the tuna. Another customer kept telling us, "The food is not cook-Ed, the food is not cook-Ed", which we did not know how to interpret, especially since he followed it up with, "You can watch him cook." Well, we quickly learned what "not cook-Ed" meant - the meal came out, completely raw. Yup, raw shrimp, raw tuna, on a bed of raw veggies and a spicy/tangy dressing. It tasted good all things considered (hunger makes the best chef? ), but I did feel uneasy about eating raw tuna considering I am pregnant, not to mention just the week before Pastor Perry had told me a horror story about finding a wiggling parasite in his tuna steak once. It was one of those meals that are okay - but only once. In hindsight, I really shouldn't have eaten it - hunger had clouded my better judgement. After this interesting lunch, we rented some snorkeling gear from a local shop and went to Santa Maria beach for a couple of hours. The winds were high (off season, remember) so the water was choppy and a bit murky, but we were able to explore the reefs and saw some cool tropical fish. We then made our way to our hotel for that night. Our plan was to travel to a different town each day, and stay there, so we were only at this hotel for the first night. The hotel was small, lovely, and locally owned. We went to the grocery store next door and loaded up on water, sunblock, and some other necessities for our trip. After that, we found a little taco place for dinner and enjoyed the quiet evening. By Tuesday very early in the morning hours, I started to not feel so good. Thankfully, I have a stomach made of lead, so food poisoning is typically mild and short-lived for me. Even so, it took me until midday to feel well enough to finally mobilize and check out of our hotel room. Not sure if it was the raw tuna, the tacos, or the sum total of strange, spicy foods. My husband only had a mild brush with it. 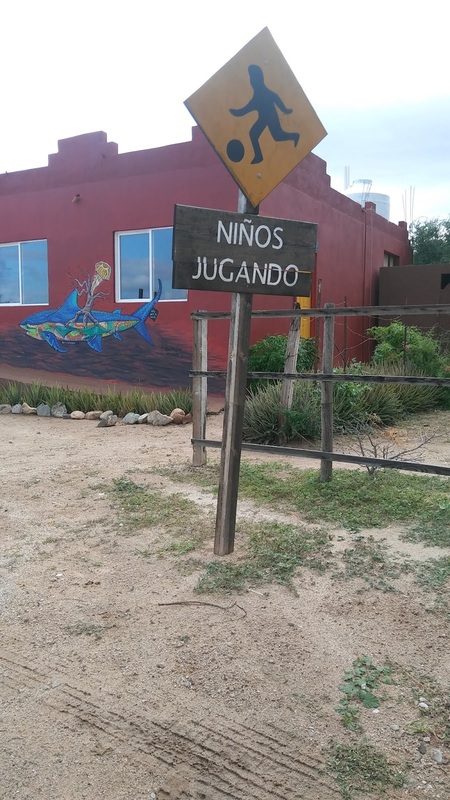 Our plan had been to go to Cabo Pulmo, which reportedly has the best snorkeling anywhere in Baja. The only downside is that this tiny village is 20+ miles down a remote dirt back road, following a 2-hour drive on a winding (but paved) highway away from the Los Cabos area. The dirt road had suffered some serious damage in the recent hurricanes and subsequent flooding. Some points were almost impassable. 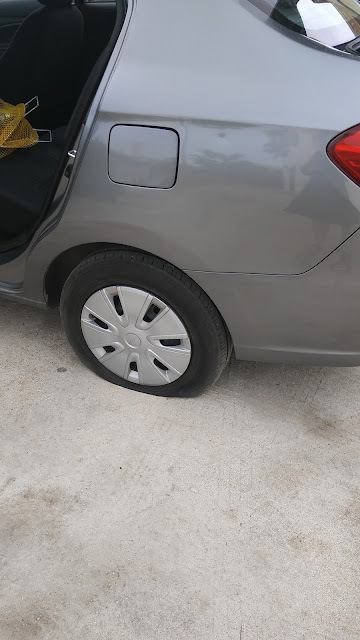 We got a late start on leaving for Cabo Pulmo due to my being sick, and finding that our rental car had a flat tire. As my husband was putting on the spare, it started to rain torrentially. We took the tire to get fixed before setting out and arriving in Cabo Pulmo in the late afternoon. Cabo Pulmo has about 100 people living in it. Their main source of income is taking tourists out on boats to snorkel and SCUBA. The entire village is off-grid, living off solar energy and (I'm guessing) rainwater collection. 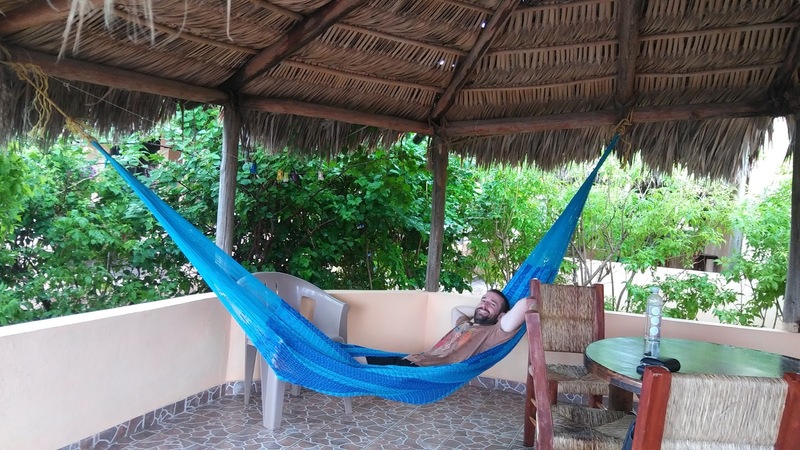 We checked into an adorable little palapa for the night, and then drove another 3 miles down the dirt road to a beach where we could snorkel from the shore, without having to rent a boat. The waters were pretty rough due to the high winds, though, so we didn't see anything exciting. Well, as it turns out, car keys and sea water don't mix well. :( To be specific, the battery in a keyless ignition fob does not do well when accidentally exposed to sea water. As soon as we realized that the key had taken a bath, I dried it out as well as I could, and we drove back to the village immediately in case the fob would die and we would get stuck, after dark, on a remote beach 3 miles from a tiny village in the middle of nowhere. Thankfully, the car started just fine. We parked it at our palapa, went for dinner and a walk on the beach, chased some crabs along, and enjoyed another relaxing evening. That relaxation screeched to a halt when, before retiring for the night, my husband wanted to get something from the car. It was at this point we realized the key fob was no longer working - not to unlock the car, but far worse not working to turn on the ignition. When I took the key apart, to my dismay I discovered that there had been enough water left in the key to corrode the battery in a matter of hours. Salty sea water is highly corrosive, it turns out! I scraped off the corrosion, dried everything carefully, but still the battery was dead and the fob would not work. We left the fob open and the battery out all night, hoping it would dry completely and regain just enough charge overnight to start the car one last time so we could get back to civilization. There was no way we would be able to buy, beg, or barter the right battery in this tiny village, so we really weren't sure what we were going to do if the battery was completely toast. Tip: never, ever, buy/rent a car with keyless ignition. If the battery in the fob dies, most models do not have a way to start the ignition without the fob, and the car will need to be TOWED to the nearest dealer. We called Dodge, and that's what they told us we would have to do. Sure, we're only in Mexico, in the middle of nowhere, three hours from civilization down a dirt road, but can you send a tow truck??!? Also, if you accidentally lose the 'keyless key' while out and about, and turn off the engine, there is no way to get the car turned back on, at which point people get helplessly stranded. Keyless ignition plus the craziness that comes with taking care of kids just don't mesh for me. If my car can start without the key locked into the ignition, it is only a question of time before I mess up and lock myself out. Case in point. In spite of this little setback, I slept like a baby that night. Not like worrying would have changed anything. Plus, as we jokingly reminded ourselves, all this was STILL a lot easier than our everyday life at home. Wednesday morning rolled around, and with it the million-dollar question - would they key work just once more, to turn on the ignition? I put the fob back together, and my husband went to start the car. He tried several times - nothing. Then on the sixth or seventh try, the engine came on. Hallelujah! Sweet relief! Our original plan for the morning had been to take a boat out to the reefs, away from shore, for some of the legendary snorkeling we had heard about. With the engine being on, there was no way we were risking turning the car off again, and instead loaded up and made our way back to civilization. "Todo para el gallo de combate" - a store that sold cockfighting supplies. No joke! When we got back to the big city, we tried three different stores before we were able to find the correct battery. We replaced it, and the key fob worked perfectly again. Still, we went back to the rental car company, and asked them to exchange our car for one that DID NOT have a keyless ignition, which they did. 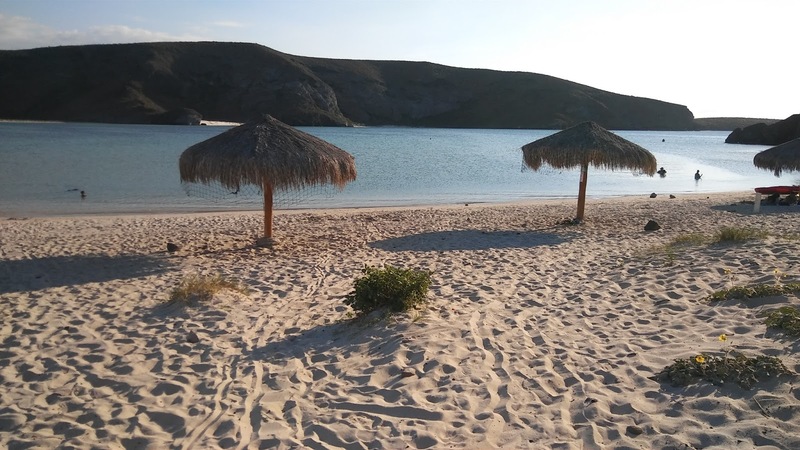 All that being taken care of, we headed to a beach between Cabo San Lucas and San Jose del Cabo for some more snorkeling, Chileno Bay. The waters were again choppy and murky, but we had fun. Being pregnant, the biggest challenge for me is to get out in the water past the surf without getting knocked off my feet and falling onto my growing belly. Once I'm out in the ocean with fins, a mask, and snorkel, the waves are not nearly as daunting. Just below the surface is a quiet world all its own. Snorkeling is one of the few sports I truly enjoy. 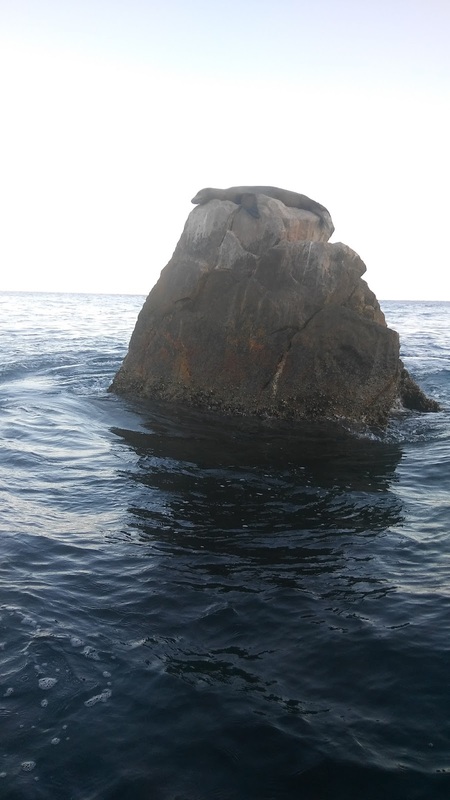 Shortly after lunch, we once again left the Los Cabos area, to head up north to La Paz as had been our plan originally. 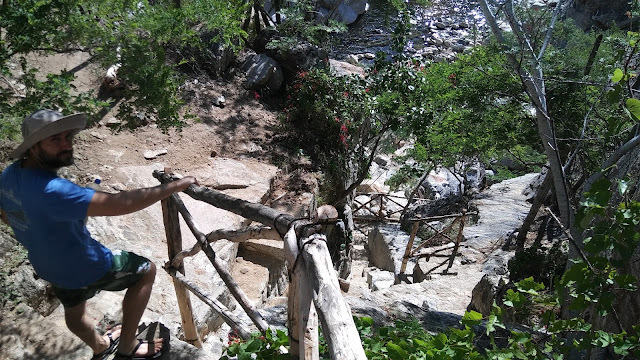 The drive took about three hours, winding through the mountains on remote roads, along the coast of Baja on the eastern (Sea of Cortez/Gulf of California) side, and through small towns and hamlets. It was very relaxing. 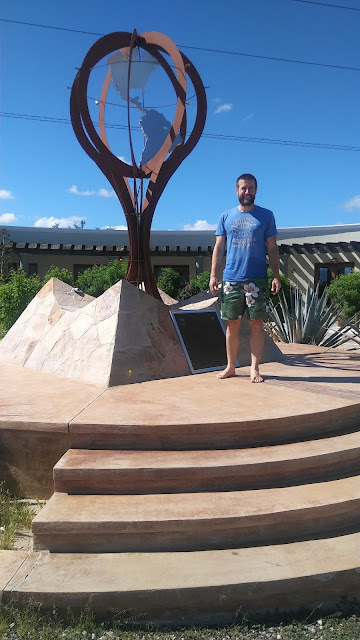 Along the way, we stopped at a monument that marked the Tropic of Cancer, the official gateway to the tropics. The red line on the ground is the latitude marker. Just a short way past that, we made another detour to a waterfall and swimming pool in Canon de la Zorra near Santiago. The hike down to the water was relatively short, but incredibly steep as the pool was at the bottom of a canyon. There were steps hewn into the stone walls, as well as rope along the wall to hold on to, but being pregnant and having my center of gravity in the front, it was still a challenge. 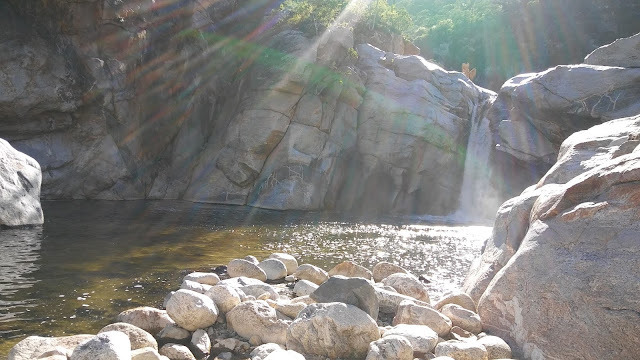 I got to the bottom safely (my husband was not a concern, he leaps over boulders like a mountain goat) and we went swimming. The water was shallow for the most part, except for right near the waterfall. I got a little bit too close, and got sucked into a foaming whirlpool between the waterfall and some cliffs that would have dragged me under, except that my husband was close by, grabbed me by the arm, and pulled me back to safety. I stayed in the shallow end after that little scare. The climb back up, while more strenuous, was easier than down due to my center of gravity working in my favor going up the walls. We arrived in La Paz just as it got dark, hungry for dinner. Up to this point of the trip, the food had been 'meh'. I can get better Mexican food than that in Phoenix. We both wanted to hit it out of the park for dinner, and Google maps with its reviews helped us do just that. We found a little family-owned asadero, where we dined outdoors on steak tacos and al pastor pork tacos with all the fixings. It was delicious! We planned on staying in La Paz the entire next day, and not leave until Friday, so we checked into our hotel for the next two nights there. It was located right on the waterfront, with miles of paved walkways in both directions along the water. On Thursday morning, my husband wanted to go on a long run. 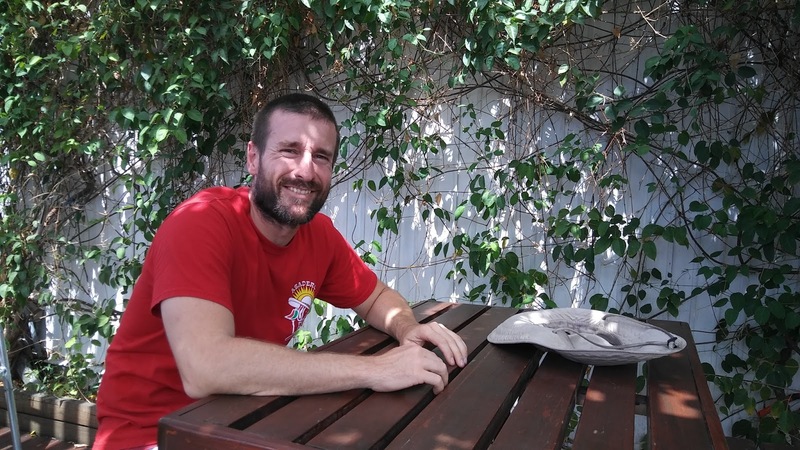 He is training for another ultramarathon. Running barefoot on pavement is his favorite way to run, so he wanted to take advantage of running along the waterfront. I didn't mind staying behind at the hotel for a few hours. It gave me a chance to sleep in (a luxury I don't have at home), have a leisurely breakfast at the hotel, work on a cross-stitch project I started two years ago on the Maui trip but have not had time to finish, and do some work on the computer that I had wanted to do anyway. My husband got back from his run shortly before lunch. We went out for pizza (I needed a break from Mexican food), and headed up the coast to Balandra Beach, about 30 minutes north of La Paz on the bay. This beach has a massive bay, about half a mile wide, and as deep inland, but the water never gets above waist high, with zero waves. It's like one giant zero-depth entry kiddie pool. The water was an amazing turquoise. The shore was picture-perfect: sandy beaches with palm leaf shade palapas. There were some other local families with little kids playing in the water, but virtually no tourists. Off season for the win! After some time in the water, my husband wanted to hike around the hills on the shore. I much preferred staying in the water and watching him from shore. Even though the water was shallow and few fish in it, I still had fun snorkeling around slowly and discovering the underwater microcosm. I found a few angry crabs, interesting shells and plants, and a ton of mussels once I knew what to look for in the sandy floor. Floating in the warm, shallow water, exploring, was so relaxing it almost felt therapeutic. When my husband got back, I asked him to hail down the Mexican lady who was selling wares which she very skillfully carried and spun around on her head. It looked like it was something sweet and edible. :) As it turns out, she was selling homemade cinnamon doughnuts. Massive ones at that! It was delicious. We headed back to town in time to make it before dark, and went back to dinner at the asadero from the previous night before retiring early for another good night's sleep. Friday morning, we had a late breakfast at the hotel, packed up, and checked out. Before heading out to Cabo San Lucas, we rented bikes and drove up and down the waterfront on the trails my husband had run the previous day, and finished it off with some gelato on the shore. It was a beautiful morning. To get back to the Los Cabos area, we this time drove down the western side of the Baja peninsula. It was a shorter drive (2 hours) on faster roads, but not as scenic. Halfway along the way, we stopped for lunch and some shopping in Todos Santos, a small town that attracts a lot of tourists and expats, though there were not many when we were there. 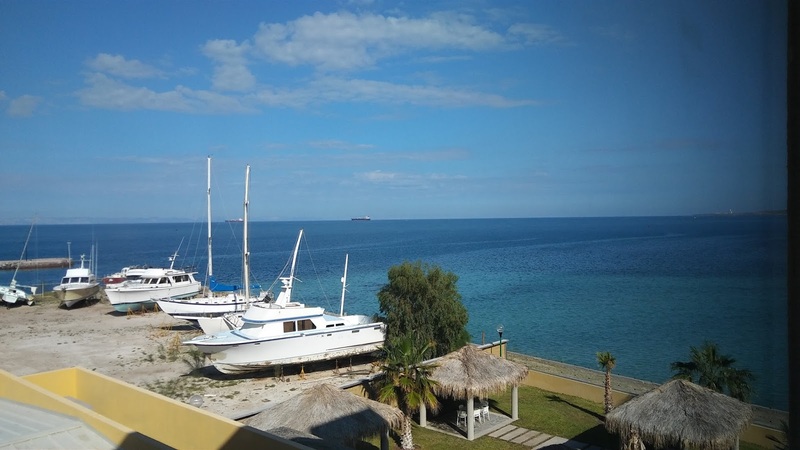 We arrived in Cabo San Lucas on Friday afternoon and checked into our last hotel of the trip. This was another small, locally owned hotel, very close to the water. 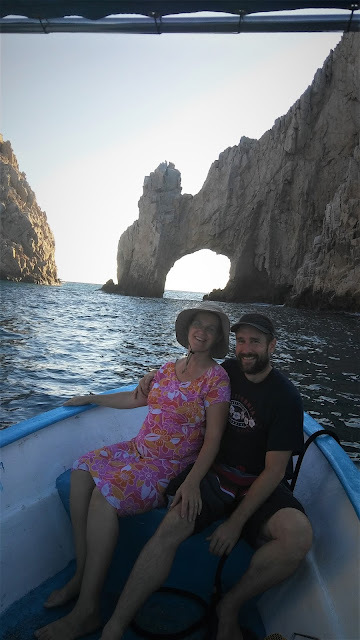 After getting settled in, we drove down to the water for - you guessed it - some more snorkeling and hopefully a boat ride out to the famous 'El Arco' and 'la ultima piedra de la peninsula.' As we arrived at Cannery Beach, we were approached by a local who offered to take us out on his boat to see the sights. We told him we wanted to go snorkeling first, but would meet him back in an hour to go on the boat ride. The snorkeling at that beach was the best it had been anywhere on the entire trip up to that point. There was a small reef that attracted many tropical fish, while the waters were calm and relatively shallow. We snorkeled for an hour, and then went looking for our boat captain. We could not find him anywhere and started walking back to the car, when we ran into him on the way to the parking lot. He was as happy to see us as we were to see him. He only wanted $15 for each of us for an hour-long boat tour. Back down at the beach, we hopped into the boat, and off we went. 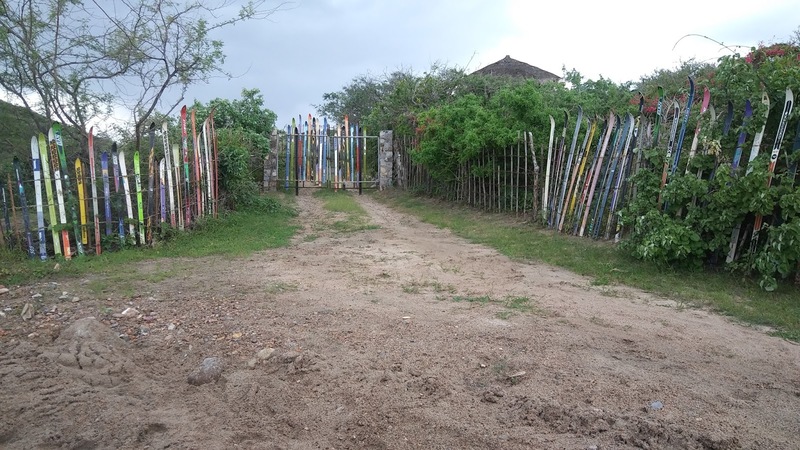 Our 'guide' gave us a private, up-close tour of all the tourist spots at the very tip of the peninsula. 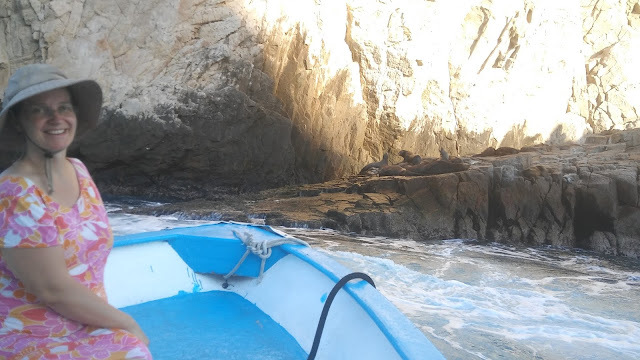 While the larger boats had to stay farther back from the rocks, we were able to get right in front of them. 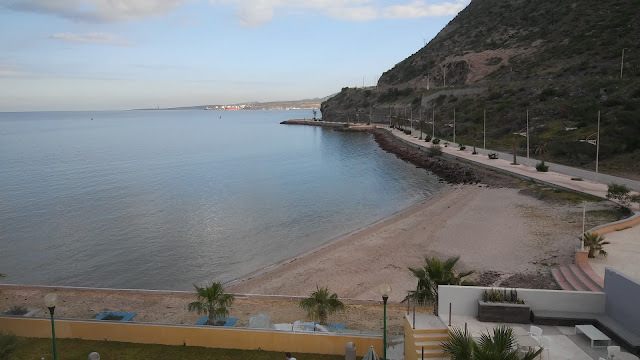 Right at the tip, the beach is called "Lover's Beach" on the calmer Gulf of California side, and "Divorce Beach" on the tumultuous Pacific Ocean side. Both beaches are only accessible by boat. 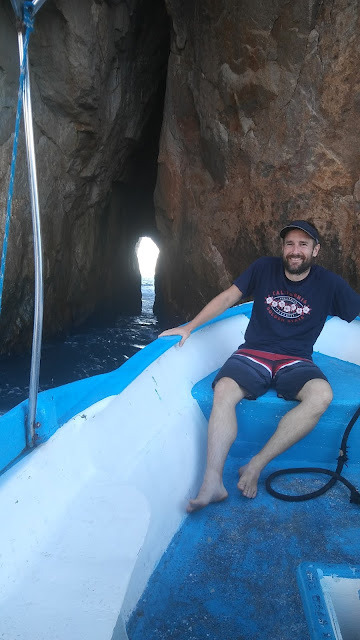 On Lover's Beach, our guide pointed out a cave to us where "two people go in, and three people come out nine months later". That seems to be a Mexican theme. Ten years or so ago on a trip to Mexico, we bought a wool blanket that was hailed to us as bringing that same blessing to its owners: "two go in, but three come out". We still have that blanket. In fact, it's my husband's favorite because it is cool in summer and warm in winter. He uses it every night. As you can tell, that promise has held true for us! That $20 blanket has turned out to be the most expensive purchase we have ever made! The "Pacific Window" looking from the Gulf of California out into the Pacific Ocean. These sea lions smelled absolutely terrible! A lazy sea lion sunning on "la ultima piedra"
On the way back towards shore, our guide stopped in a fabulous spot for snorkeling. We had brought along our gear and hopped into the water from the boat. The fish were many and abundant already, then our guide threw in some dried tortillas he had brought along to feed and attract the fish. They were everywhere - a truly amazing sight! This even topped the snorkeling we had done near the shore an hour earlier. It was a wonderful conclusion to our trip. We got back to shore as evening fell, and drove back to our hotel tired, happy, and hungry. Our room looked out onto a cute little court with an Italian restaurant in the center that came highly recommended on Google, so we went there for dinner. It was a rather fancy affair, with a divine tiramisu to round out the meal. Just as we got done, I got a call from back home. Solomon had gone walking around the pool barefoot after dark, while on the phone (teens! ), and been bit on his foot by something very painful. We were able to ascertain that it was a black widow spider bite. It is very painful and pretty poisonous (the venom is reportedly 15 times stronger than that of a rattlesnake), but it's not deadly, and there is little that can be done to 'treat' it. There is an antivenom, but it causes more complications than the spider bite itself, and is therefore reserved for critical cases only. I gave some tips on how to treat it naturally, what to watch out for should a trip to the ER become necessary, and told him to take some pain killers. My husband had been bit by a black widow a few months ago, so this was not our first experience with it. The first night was the most painful, and Solomon had to stay home with his foot elevated and iced for a couple of days, but has since made a complete recovery. Saturday was our day to fly back home. We slept in one last time, packed up, and headed to the airport where we returned our rental car and flew out shortly after lunch. I hadn't used one of these in about 30 years! We got home just as the little kids woke from their naps. They were happy and excited to see us! I had been most worried about Chloe not doing well with me being gone for almost six days when she is only 16 months old, but she did great. Dad is her preferred parent at the moment anyway - she was thrilled to have him back. She still sleeps in my bed, though she usually prefers to hug up against the wall and not me. That first night back home, she slept tightly snuggled to my side, waking up regularly to pat and stroke my arm while she was half asleep. So sweet!! She has since gone back to hugging the wall, lol! Sunday was a quiet day. 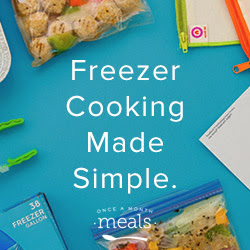 I still had plenty of precooked and frozen meals, so re-entry into the real world was smooth. My mother-in-law stayed with us for church and lunch before flying back home to California. This week was our fall break, after the kids finished the first quarter of the school year while we were gone. Having a scheduled break allowed us to take things easy this week, tie up some lose ends, catch up the younger kids' school work, etc. 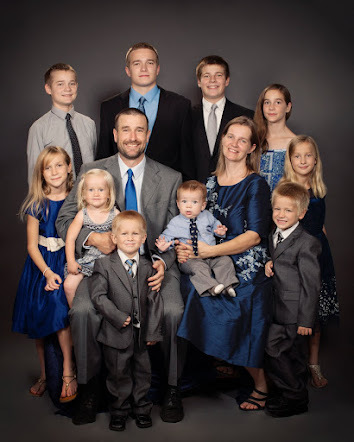 Next week starts week 10 (of 36) of our homeschool year. 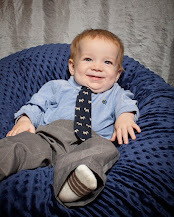 The goal is to make it through the first semester before taking a break in mid-January for the arrival of the new baby. Our vacations are like a snapshot of our life in general - despite snafus along the way which are often self-inflicted (food poisoning, broken car keys, dangerous whirlpools, spider bites, etc. ), the end result turns out to be better than the sum of our parts, thanks to the grace and mercy of God. It's like a chocolate chip cookie: some of the individual ingredients can hardly be stomached by themselves, such as baking soda or a spoonful of salt. But the end result turns into a delicious cookie. It's easy to focus on the negative and get down, or we can choose to focus on the positive and go rejoicing down a sometimes bumpy road. The people in Mexico were all super friendly. We never felt in danger, or like our stuff was going to get stolen if we left it behind on shore while we went swimming or in the car. 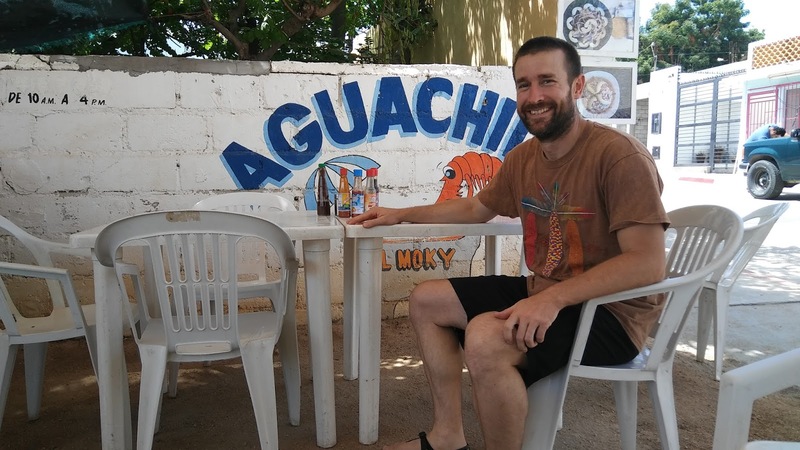 Everyone was helpful and generous, nobody tried to rip us off or take advantage of us gringos. The only trashy people we encountered on the trip were drunk tourists, but thankfully there weren't many of them. The Mexicans seemed somewhat cleaning-obsessed. Sweeping seems to be a national pastime - sweeping driveways, sweeping public streets, even raking the beach. Everywhere we went, there was the smell of cleaning supplies and laundry detergents. Overall, Mexico very much reminded me of Hungary, which was sweet. Thank you to everyone who made this trip possible. Without regular time spent relaxing, refueling, and taking in God's creation, the ministry would sooner or later burn us out. It was wonderful to get away from it all for a week, and wonderful to get back to our normal life. As I had mentioned in my last post, I had the opportunity to speak to the ladies at the Foundations Conference on the topic of "Homeschooling 101." Unfortunately, there were some technical failures with the recording of that seminar, so I am not able to share the video as originally intended. However, in preparation of the conference, I offered the same seminar at our church as a 'trial run', which was recorded. It speaks a little more specifically the laws in Arizona, but otherwise contains the same information. To view a copy of the handout that summarizes the content of the seminar, please click here. 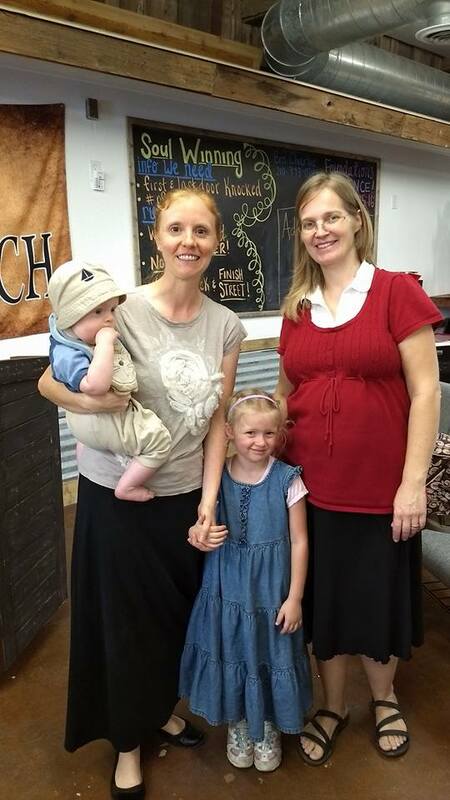 I recently had the privilege to speak on the topic of homeschooling at the Foundations Conference hosted by Old Path Baptist Church in San Antonio, TX. I will share the video of the seminar on homeschooling once it's been edited and published. My husband and I like to take turns bringing just one of the kids along when we travel. He obviously does a lot more traveling than I do since it's part of his job. 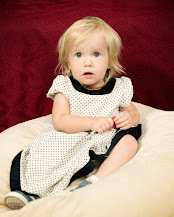 :) It was Becca's turn to go with me, since I had taken Miriam with me two years ago on a trip to upstate NY. 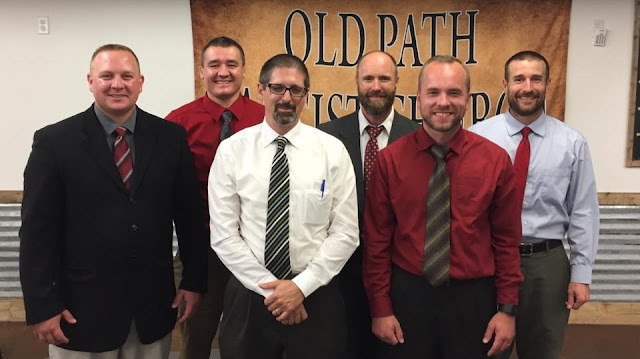 I loved getting to meet the wonderful people at Old Path, as well as some of the other preachers and their families which I had not yet met that were guests at the conference. Pastor Perry and his family are always a blessing and encouragement to be around. I was surprised and quite a bit embarrassed by the surprise the church had in store for me: as a thank you for coming out to the conference, they collected money for the express purpose of replacing my 25+ year old kitchen countertops! What a sweet, thoughtful, and incredibly generous surprise! The tile had been breaking in various places, not to mention it was near impossible to keep the grout clean. Becca and I got back to town from Texas on a Monday morning. By Monday afternoon, I had priced various materials and suppliers, found one that was both highly recommended as well as offered the best prices, and had made an appointment for the work to begin on Wednesday. Isaac spent Tuesday getting off the old tile counter, which saved us $300 in additional labor. Not to mention, he had fun doing it, and I paid him $20 to do it. On Wednesday, the workers removed the old plywood, repaired the sink cabinet which had old water damage and was too weak to support new counters as it was, and finally installed the new granite counter tops I had chosen. Enough money had been donated to also replace the sink, faucet, and garbage disposal. These pictures show some of the water damage to the sink cabinet. On Thursday, once the counter had had a chance to set and dry for 24 hours, my husband hooked the plumbing in the kitchen back up, and I grouted the area between the counter and the tile backsplash. Having been three days without a kitchen was a logistical challenge, but I was able to draw meals from my perennial freezer stash so it was not a biggie. Not to mention the end result was SO WORTH IT!! My mother-in-law repainted my kitchen and the hallway last week, so that the final colors are all nicely matching, and also bought three new of the shorter bar stools which had taken a lot of use from the kids. Isn't it beautiful??!? I love my new counters! They have given new life to my kitchen, and are such a pleasure to work on, not to mention so easy to keep clean. I can now roll dough straight on the counter, rather than having to use a pastry board. The new sink is also much easier to work with, since it is a lot deeper, and is mounted under the counter. The final cost of the project, even after the unexpected expense for repairing the broken sink cabinet and fixing some of the plumbing, came within $20 of the amount that had been donated. THANK YOU to the precious people who gave toward this fund! May God bless you richly in return! Please know that you have brought much joy to my life by making my kitchen, a room I spend many hours in each day, much more beautiful and functional.